Get your message out to the masses with targeted marketing using real estate door hangers. 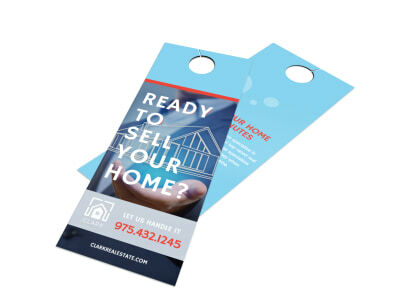 Our collection of real estate door hanger templates will help you reach the maximum number of leads within your target market & get you their first. 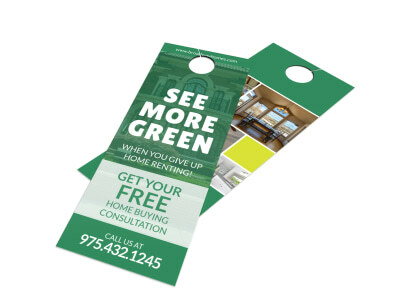 Swoop in and score listings from homeowners who are considering selling their homes, or advertise your services to a wide audience affordably with your custom design. Simply add your own photos, graphics, art, and more, and then add and manipulate text to create a striking design that grabs attention. 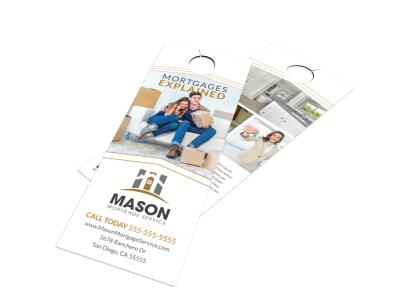 We offer printing of your door hangers using quality materials, or you can choose to print them yourself from any location. 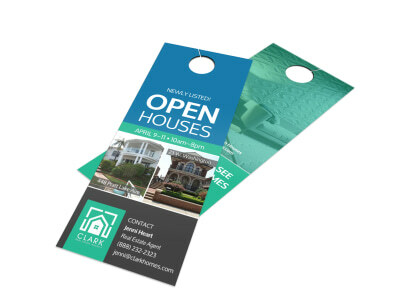 If you’re holding an open house at one of your listings, you need to find a way to generate foot traffic. The simplest answer is usually the right one, so make sure to include the other residents in the same neighborhood. 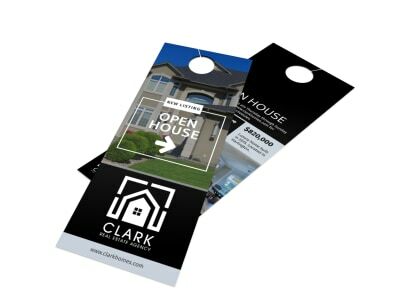 Let them know they’re invited by creating a custom real estate door hanger with the open house details, along with a great photo of the property (and of you!) and your contact information. 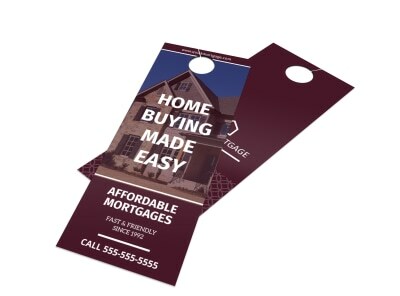 Homeowners who walk through their neighbor’s open house may be inspired to put their own home on the market – and you’ll have put yourself in the perfect position for another listing and subsequent sale! Sometimes the impetus needed to put your home on the market is the knowledge that one of your neighbors just sold theirs for a great price. 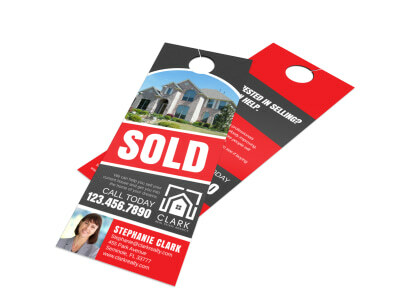 As a real estate agent, broker, or Realtor®, your best advertising is a successful sale. 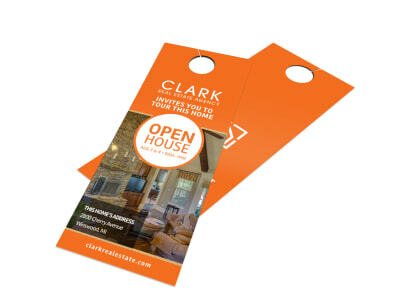 Create a well-designed real estate door hanger to promote your business with your recently sold properties. 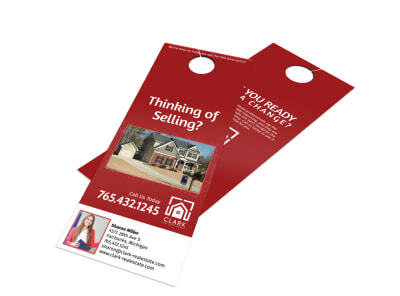 Include the pertinent details, like selling price, time on the market, and square footage, and don’t forget to include your photo and contact information. 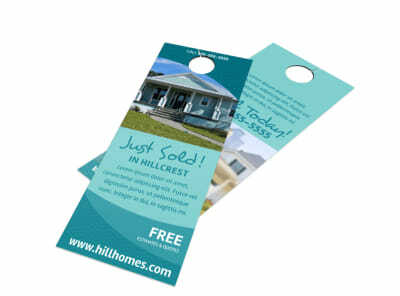 These “Just Sold” door hangers can be hung on every house in the neighborhood. 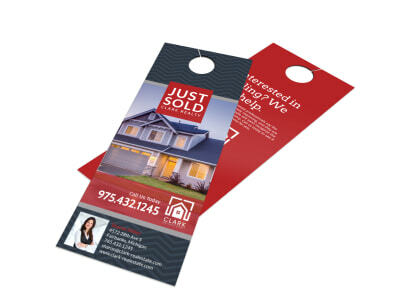 The best part – you can swap out house information and print new sets for future sales! 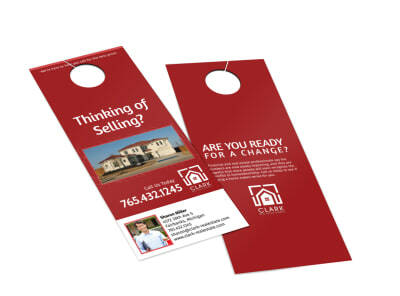 Encourage homeowners to get their move on with a custom-designed “Thinking of Selling” door hanger. 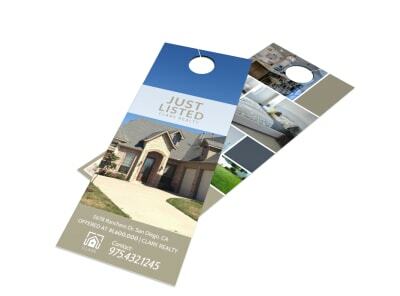 Motivate them by listing recent sales in and near their neighborhood. You could even include some of your comparable current listings so that they could envision themselves living somewhere else. As a real estate agent, broker, or Realtor®, you are the expert in your field – share your knowledge with potential sellers and give them a reason to hire you to sell their property. 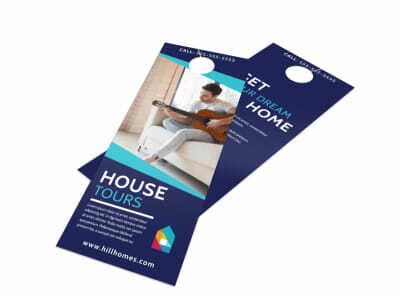 Include your photo and contact details – make a memorable impression. 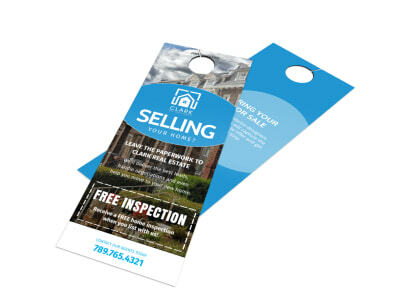 Distribute the door hangers in your ideal neighborhoods and be ready to encourage all your new sellers! 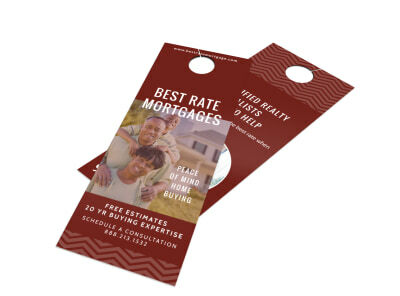 As a real estate broker or Realtor®, renters are one of your biggest untapped client sources. Get them moving by making the case for buying versus renting. 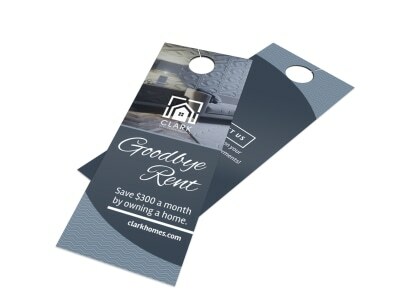 Most renters would be surprised to learn that they can get into a house for the same or less as they are paying in monthly rent. Take the time to educate them, and you will have created a completely new revenue source for your business. 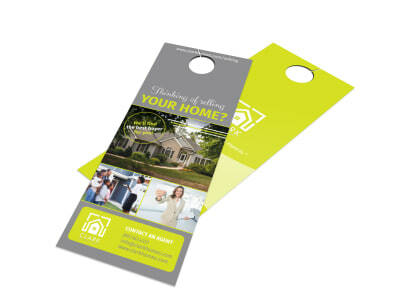 Design an informative door hanger that compares costs involved in buying and renting side-by-side. 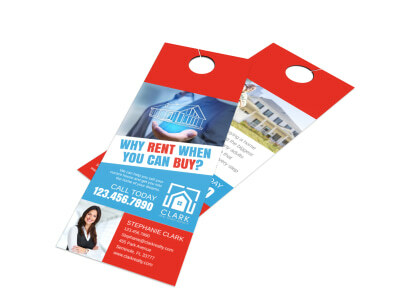 Don’t forget to put your face and contact info all over it, and hang them at every rental property in your area! 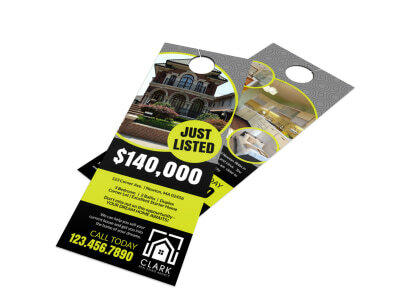 Real estate is what you know – put your skills to good use by designing and distributing “Just Listed” door hangers within your listing neighborhood and within target buyer neighborhoods that you identify. You’ve already taken great pictures of the new listing, so don’t let them go to waste – pick a great exterior shot and one or two of the best interior shots. 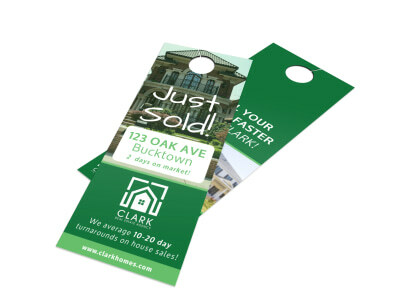 Highlight the key property details, like price, square footage, and number of beds/baths - your door hanger should tell a story and entice the reader/prospective buyer to want to know more. 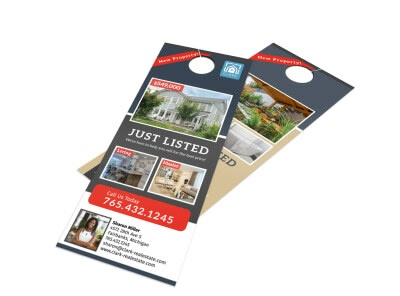 Save your design and print a set for each new listing!